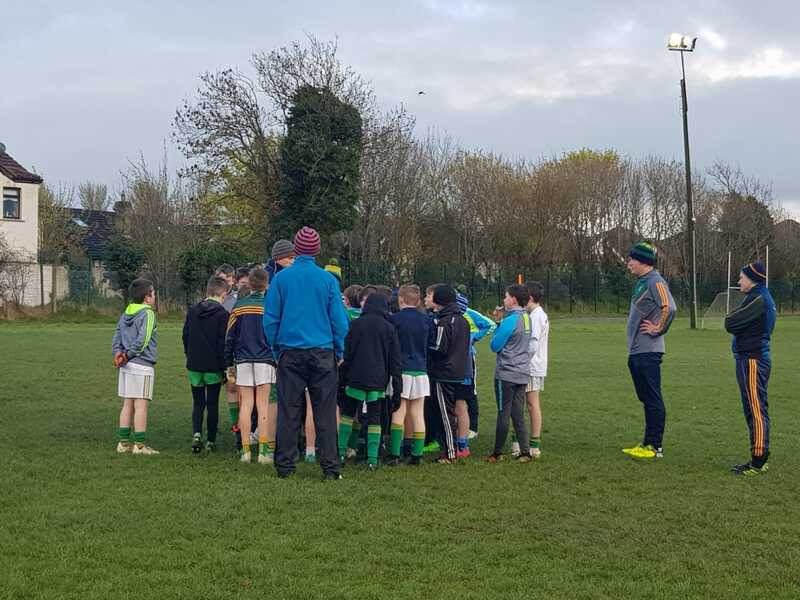 On Tuesday evening, 40 young boys braved the cold elements in what was described as one of the most talked about event of their session. They had heard whispers of who was coming with an atmosphere that can only be described like Christmas Eve and the boys couldn’t sleep with excitement. Alan Brogan, one of Dublin’s top players, kindly gave his time to come the and share his wealth of knowledge to the under 11&12 Boys on the greatest amateur sport in the world (OK I’m being biased here). He spoke about this experience and training, having mastered “All Ireland Titles” with the Dublin team. The pride he had in his club is evident through his passion for the sport. He gave his free time to the boys, sharing his experiences within the sport and how he developed into the player and coach he became. Each boy proudly showed him what they were made of. Coaches beamed with delight as the Kids performed for him. Alan brought the kids through some drills on passing and catching and all in all the team focused on team work and working with each other. To have someone as experienced as Alan join in a training session for the kids was remarkable. I’m sure some people would question why have a Dublin player come to a Kildare club. Experience and coaching come from all levels and all counties. To raise awareness within children that the GAA holds no bounds. That talent must be recognised with players from other counties while hold pride in the Jersey you wear. That respect comes in all forms and you can gain knowledge and experience from everyone (not just people in your county). Alan was once a child with dreams and ambitions but though dedication, focus and hard work his dreams became a reality. This is what we are hoping for. Kids aspire to become their idols. They dream to be on the same playing pitch as them. Tuesday evening their dream was reality. Parents stood proud on the side-lines (frozen to the bone) but the kids put on a great performance with Alan commenting on how great the bunch of lads they are. To be honest, I think he is right. Each child turns up for training come hail, rain or shine. The commitment they put into their club is truly outstanding and not to be questioned. Our club are proud of all our outstanding talented young players (not just on our team).